Found in February 1881, The Tribune newspaper is now a leading newspaper in Chandigarh and also in major cities like Jalandhar, Dehradun, Bathinda and New Delhi. 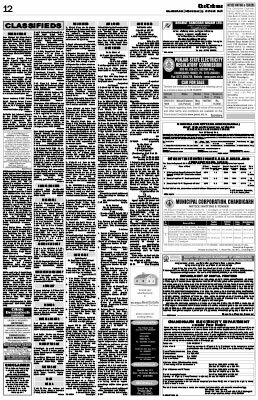 If you wish to create a major impact of your brand or ad in Chandigarh and Punjab via newspaper advertising then you must book ad in The Tribune Newspaper. As estimated by the Indian Readership Survey, the newspaper has a readership of approximately 7 lakhs which will be beneficial if you book classified and display ad in The Tribune Newspaper. With highly up to date and informative content, The Tribune Newspaper has made a good name in the print industry. The Tribune advertisements rates do a full justice to your brand as they are quite nominal and give maximum return to your product. Overall, The Tribune newspaper advertisement can be a game changer for your product targeting the elite class of Northern India. You can avail special discounts and attractive combos with bookmyad if you Book online advertising in the Tribune Newspaper, business ads, property ads, matrimonial ads, tender ads and many more. With us you can make your advertisement reach out to people all over the nation on a big scale including major cities like Delhi, Mumbai, Bangalore, Kolkata, Chennai, Chandigarh, Nagpur and many more other cities like these. Contact us for best packages and discounts.